Ron Daniels, Institute of the Black World; economist Julianne Malveaux; entrepreneur George Fraser; E. Faye Williams of the National Congress of Black Women; and New Jersey activist Lawrence Hamm of the People’s Organization for Progress talked about the presidential election at the State of Black World town hall meeting in Newark, N.J., on Nov. 18, 2016. Activists and intellectuals in Newark, N.J., talked for two hours Thursday night about what to do now that President-elect Donald Trump is a reality. Because "Brick City" has a history of utilizing black and brown power to affect public policy, the city’s Mayor Ras Baraka—the son of late activist-artist Amiri Baraka—not only joined in but handily led the discussion. The mayor warned the crowd of at least 700 people who attended a town hall meeting held by the State of the Black World IV conference, a forum of the Institute of the Black World 21st Century, that the focus of political attack should be on the enemies of black people, not one another. In this all-hands-on-deck atmosphere created by the presidential election, Baraka claimed that black people must be sophisticated enough to argue but also to stay together in struggle. “We have to argue with each other, but that doesn’t mean we walk away,” he warned. If not, what happened in New York City in 1993—when black Democrat David Dinkins was replaced in the mayor’s chair by Republican racist Rudy Giuliani—can happen again. He chided the audience—many of whom were old enough to be fellow activists during the same time his father fought to elect the city’s first black mayor, Kenneth Gibson, in 1970—to remember that struggle is just a means to an end: “The object is to win. We’re not activists and revolutionaries because it’s fun. … We romanticize that too much.” It was almost a funny comment to make to this very red-black-and-green crowd of black-power-era septuagenarians, one that was openly happy to spend all week together hashing out strategies for black survival in the age of President Trump and beyond. Baraka pointed out that there has yet to be a systemic critique of the election: “We talk about the candidates, not the system … I don’t know of anybody who ran for president who wasn’t flawed.” He cracked that voters should choose a candidate who will reflect their interests instead of looking for Malcolm X. And he had no problem pointing out that many who could afford the conference registration and hotel might not be as close to the people as they think, if any thought that it didn’t matter who won the contest between Hillary Clinton and Trump. The nation’s working poor will be affected by this election “immediately,” he said, clearly thinking about his city, filled with such people. His comments—which got a standing ovation—came during a passionate discussion from black activists and intellectuals on what to do next. Panelists: Economist Julianne Malveaux; E. Faye Williams of the National Congress of Black Women; Melanie Campbell of the National Coalition for Black Civic Participation; Lawrence Hamm, chairman of the New Jersey-based People’s Organization for Progress; entrepreneur George Fraser; the Rev. Waltrina Middleton, associate dean of Howard University’s Rankin Memorial Chapel; Chinyere Tutashinda of the Center for Media Justice and BlackOUT Collective; and Rev. Lennox Yearwood of the Hip Hop Caucus. So, what to do next? Agitate, agitate, agitate. Yearwood and Middleton mentioned joining the Standing Rock conflict, where Native Americans have united to protect their land from the Dakota Access Pipeline. Hamm called for a return to mass demonstrations and meetings. He called for four events within the next year: a city march against Trump next month; a national black political convention in the tradition of 1972; a statewide conference of black activists, officials and citizens to create a black agenda for next year’s New Jersey gubernatorial election; and a national march for reparations. The panel’s moderator, Mark Thompson of SiriusXM radio, added a fifth: He wondered aloud if there should be a national “people’s inauguration” in Washington, D.C., in January. Malveaux, who kept referring to “Donald Chump” all night, wanted a systemic policy—the next step from constant individual protests and never-ending Twitter feeds—to handle the continued police shooting of unarmed black people. “You cannot hashtag your way to freedom,” she said. She did want President Barack Obama, in his waning days in office, to stop all student debt, free political prisoners and publicly push for reparations. 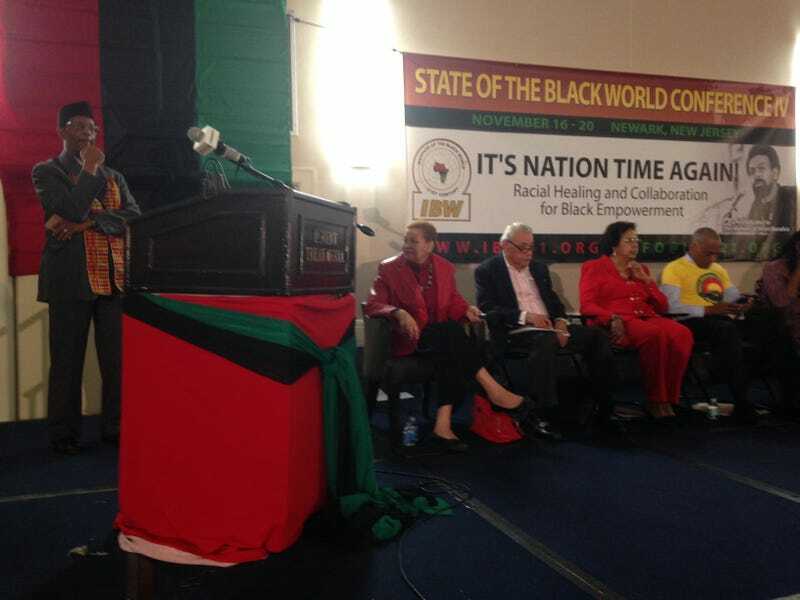 Ron Daniels, president of the institute and convener of the SOBW conference, said that black America is about to get a serious, and painful, civic lesson. The choice between Clinton and Trump was “not revolutionary, but not inconsequential. … The Supreme Court has been lost for 20 years. It’s a Plessy v. Ferguson situation,” referring to the 1896 case that legally upheld racial segregation and black inferiority in America for more than half a century. If this conference is any indication, it might be time to put away that Hamilton original-Broadway-cast album and get out those comfortable marching shoes and power bars. The eight-year American experiment might be over for black America, but the fight for anything resembling democracy seems to be, at this moment at least, in the planning stage.